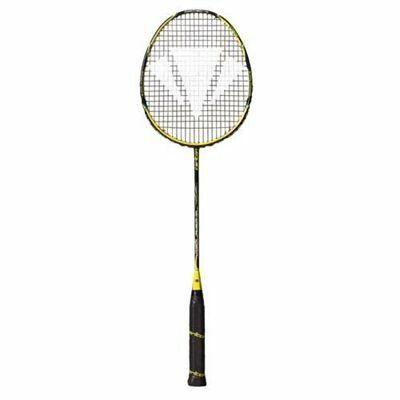 The Carlton Vapour Trail Vanquish Badminton Racket is intended for advanced players and designed to combine the best of power and control. Optimetric Headshape - results in both the bigger sweet spot given by an isometric head and also the increased air speed and control given by a conventional head shape. New Japanese Hi Modulus Carbon is used with Nanopulse Carbon construction to give an ultra consistent and stable carbon construction with maximum molecular uniformity. The result is a frame which remains more stable on shuttle impact, thus giving improved control. Pro V12 grommets - specialised softer grommets at 3 o'clock and 9 o'clock allow better string movement and thereby increased power across the hitting zone. Extreme Tension Frame - Precision engineering makes certain that your Carlton frame can accommodate 11% higher string tensions compared with other frames. for submitting product review about Carlton Vapour Trail Vanquish Badminton Racket.